No Oil, No Flour, No Sugar! If you are looking for a super sugary muffin like those you get at the bakery you will probably want to add a couple of tablespoons of brown sugar to these. I kept the extra sugar out because I wanted to try to make something without any refined sugar/flour and I think it surprisingly still tastes good! 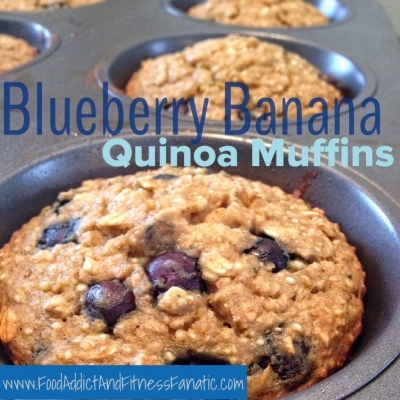 I also needed to add some more protein to the muffins so they actually fill my belly, I did this by adding quinoa. Again, surprisinglyâ€¦.YUM! Pulse oats in food processor until flour. Mash banana, mix in all other ingredients but blueberries. Add in blueberries, pour into 6 jumbo muffin tins, sprayed with coconut/vegetable oil. Bake for 20-23 minutes until toothpick comes clean. Of course you can use regular muffin tins too if you donâ€™t have jumbos, just eat two!